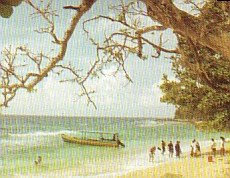 Namalatu Beach Looks out over the Banda sea on the South coast of Ambon in the village Latuhalat some 15 km away from town Ambon. Namalatu has a strip of a white sand and coral beach and crystal clear unpolluted water. The scenery is beautiful and attractive it is an ideal place for sunbathing, swim, snorkel and scuba diving. Additional facilities Namalatu beach offers are shelter, open air stage for dance and music performances and also “rujak” (mixed fruit salad with peanut sauce), fresh young coconut peddlers and on prior request people can serve you with barbequed fish and lobster.